We're not playing games anymore. Where next for gamification of learning? We’re not playing games anymore. Where next for gamification of learning? We're not playing games anymore. Where next for gamification of learning? Who remembers Pokemon GO? It hit the streets in July 2016 with a flurry of head down activity in parks and near misses on road crossings. It was a very clever mix of augmented reality, challenge and unwitting exercise for teenagers; but now it’s gone. Crazes come and go by their nature and the learning industry is not shy to them. Gamification of learning rose up a few years ago to much excitement (even though it had been used in training for decades). I did many talks on the infiltration of gamification into digital learning when it rose again to fame. As well as promoting it as a powerful addition to our design toolkit I issued a caution that we shouldn’t treat it as the new panacea for learning. This would only lead to weariness amongst our more cynical learners that we were trying to dress up our old content in new clothes. As if we would? It was a serious concern that has been raised by others. As a leading thinker on game design, Amy Jo Kim echoes these concerns and summarises that when papered over existing products, gamification produces less than impressive results. When we talk with L&D people we do hear of great successes with gamification but we also hear war stories of it being inappropriately applied – a cartoon frog awarding points, space invaders in a diversity module and a badge for reading an introduction page. This sort of thing doesn’t go down well with… err, anyone. My dream is now that the Pokemon moment has gone, we can learn some lessons and think about where we go next with gamification of learning. This post explores what we’ve learnt and talks of exciting future opportunities. 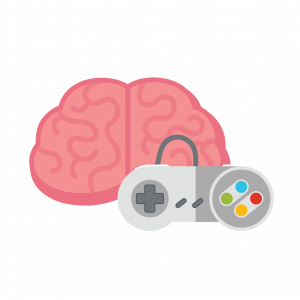 The blunt fact is that gamification is here to stay, whether learning professionals like it or not. Take a listen to the TED talk by Seth Priebatsch who wants ‘to build a gamification layer on top of the world’. He talks about Facebook providing the social layer, on top of which he wants to gamify our entire lives. Give the man a white cat and the Bond villain will be unstoppable. There’s a lot to be said for learning by doing, so why not engage with a bot. Here are some bots we’ve tried and liked. Amazon’s Alexa responds to speech commands and requests. You can use it for making to-do lists, setting alarms, controlling your other smart devices, giving you news and traffic reports, playing and streaming music, audio books, podcasts and a whole host of other things. But, critically, in doing all that Alexa is learning from your choices. Or, if you’re thinking of going abroad and fancy learning a little of the local language, try Duolingo. The Duolingo bot can teach you the basics via your PC or mobile device in just a few minutes every day. It’s like having your own tutor, in your own home or office. It recognises what you already know, identifies where you need help and practice, rewards and encourages you, and sets you targets. In short, it’s learning about you and what you need, while you are learning. Quick run across the fields, uploaded it to Strava, second-best time on a segment. Yeah! Recovery coffee in Costa, 12 points on my card so got a free latte. Cool! Browsing for holiday ideas on Tripadvisor, villa in Portugal got great reviews. Booked! Watching a film on iPlayer, as recommended by John. Cheers! My life is being controlled by gamification. I hate to say it but I suspect yours is as well. Stop and think about all the activities you carry out every day. Are they gamified? How do they manipulate your behaviour? As well as proving that gamification is pervasive, analysing your lifestyle provides ideas for learning development – with a bit of lateral thinking you may be on to your next big idea. So gamification is everywhere but also it works. I’ll go further and say it’s one of the most powerful tools there is to increase participation in anything. International speaker and creator of the Octalysis Framework for game design, Yu-kai Chou, conducted a meta-analysis of studies of the return on investment of gamification in business. The results from over 90 studies showed that gamification is having a huge impact everywhere: at the enterprise level, in sales and product initiatives, in lifestyle situations, in manipulating consumer behaviour, in education and in scientific research. A favourite of mine is The World’s Deepest Bin. A simple sound effect resulted in 132% more rubbish being collected. Elegant but just so simple. So we have huge power in our hands, the next quantum leap is to apply some of these winning ideas to learning. Unfortunately, good gamification is hard and full on game development is much, much harder. Add to that the fact that we are learning designers – multiplayer, multi-session epics are not really our thing. This is why the big US corporations employ qualified game developers in their L&D departments to tackle such things. Lucky them. A game development team has quite different roles, relating to the media richness and technical complexity of the finished piece. Interestingly, the instructional designer is replaced with a ‘level designer’ who defines the incrementally more difficult challenges and the rewards for completing those challenges. If you are now questioning your own future, don’t throw the towel in just yet. Yes, there is much to learn but there is also more of a mindset than a skill set change. There are models and tools we can use to make our inroads to gamification and game design much more rewarding. If we tease apart the skills we need to apply effective gamification, the results are more encouraging. Gamification by Design author Gabe Zichermann states that psychology plays the most significant part in it. Indeed it does, as gamification taps into the psychological behaviours that govern the day-to-day decisions, we make by providing a platform for competition, sharing achievements and managing the progress of work. Psychology is something that learning designers should be comfortable with so we are one step up the ladder. I think the issue is that we haven’t fully taken on board the additional psychology of game design. It needs a different type of thinking based on a new design model that is a bit looser than those we have historically used. There are models for building effective learning and still more for building effective gamification and games. ADDIE is the old stalwart that we are most familiar with in L&D. But I’m going to state it clearly – drop ADDIE for game design. This model is best used for the creation of linear bite-sized learning materials and comes nowhere near being able to consider the complex mechanics and psychology of game play. So what is left without ADDIE? Amy Jo Kim promotes ‘game thinking’ as the best place to start to create effective gamification. Game thinking ensures that a designer properly empathises with the audience before they start a project and that game mechanics are appropriately employed. It certainly makes a lot of sense to wipe the slate clean and use a different approach to gamification work at the outset. We took this to heart in our own organisation and devised a new model of components we felt essential in a game project. Although they aren’t all essential, it does make sure we consider them all and either define them or discard them according to the project requirements. Epic meaning – I love this term as it lifts a game from a learning experience to one with a hugely motivating reason to finish, so it’s one of the first things you need to define. Games can contain many other things (avatars, competition, badges, timeline, etc) but this basic framework sets your mind thinking differently and most significantly in a nonlinear fashion when you first sit down with your creative team. The biggest failure with much early gamification (if it wasn’t just painfully condescending) is that it had obscure relevance to the workforce. This is a tricky one because, let’s face it, work is no game. Quite the opposite, as the expletive from the forthright senior manager we met below uttered. But no one can argue that employee motivation isn’t a constant challenge when trying to push through business change as the statistic from Tim Pickard highlights. Pickard asks us to stand back and think about what motivates people at work. Personal recognition, rewards and a sense of competition are all strong motivators. The power of gamification is that it can tap into ALL these and provide unrivalled motivation. But the goal of business transformation is behaviour change and as BJ Fogg’s model shows, this requires not only motivation but also ability and a trigger as well. If we do this then bingo, we have created something that I’m convinced will show game mechanics as our superior weapon. Do all this and the Bond villain will surely inherit the earth. Interested in gamification but not sure where to start? At Learning Pool our custom content team is acclaimed in our industry and ready to meet your bespoke needs regardless of the challenge. Get in touch today to find out how our custom content can change your learning strategy. Richard Hyde, has been involved in every conceivable aspect of e-learning creation over the past two decades. The e-learning he loves the most has elegant simplicity in the learning approach, creative design and technical production. Richard has worked with global organisations and helped them revitalise their learning and their internal teams to improve their own creative development skills. He is also a regular contributor and supporter of the E-learning Network.